Richard Diebenkorn, “Woman in Profile”, 1958, Oil on canvas, 68” X 59”. Image, with artist’s signature, from Dunn International catalogue, 1963. Richard Diebenkorn’s Ocean Park series seems to have been initiated as a response to two paintings by Henri Matisse; View of Notre Dame and French Window at Collioure. 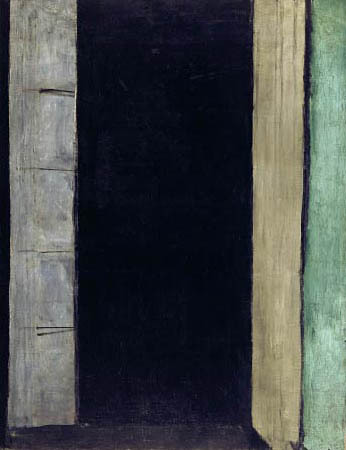 Both date from 1914 but had never been exhibited before being included in a Matisse retrospective in 1966, organised by the University of California and shown in Los Angeles, Chicago and Boston, but not New York. 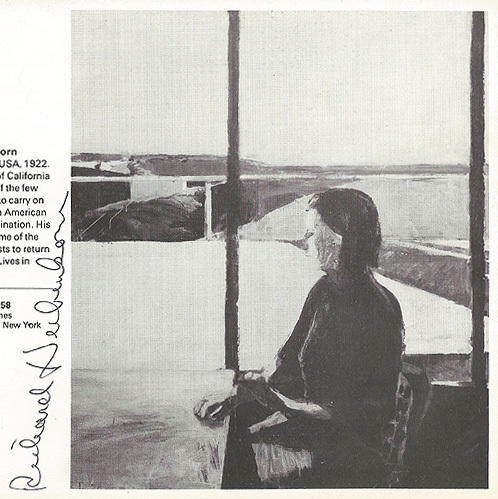 [i] I want to argue that Diebenkorn recognised something important about these paintings. He saw that they introduced and valorised a particular pictorial economy, characterised by simple means and finite quantities. Despite the difference in age, the works were similar to a kind of painting then being made in America. The same year Frank Stella’s Irregular Polygons and Barnett Newman’s Stations of the Cross series were also shown. Anyone who saw the three exhibitions would have faced an interesting triangulation; the Matisses, like the light from a new star arriving fifty years after the event, an ambitious late career statement from a major Abstract Expressionist and a set of unconventionally configured canvases from a 30 year old star of the New York art scene. These coinciding exhibitions arguably constitute an important cultural moment, and one can imagine the impact on a sample viewer of the combined experience. It would be clear that the terms of a new pictorial economy had been constructed, validated and even historically provisioned, by obviously successful, high net worth examples. It would also have offered evidence for the possibilities of abstraction made under the auspices of this economy. What I want to suggest is that it is impossible to fully understand abstraction’s contemporary potential, and past achievements, without recovering this moment and absorbing an appreciation of the associated pictorial economy into our critical apparatus: So there. Man and Woman in Large Room (1957) and Sleeping Woman (1961) had the colour-promoting characteristics of flat paintings, but they were ‘inhabited’. That meant that the eye differentiated between elements that belonged to the occupant(s) and those that did not. Woman in Profile (1958) makes this point quite literally with the shape of the sitter’s nose fusing with the wedge formed by the diagonal in the landscape beyond. While the figures and landscape/interiors are rendered in the same formal terms, there is a different kind of experience with the people. This is hard to account for without importing anthropomorphism, but it seems an unavoidable psychological aspect of the ‘figurative’ genre, not so obviously found in ‘uninhabited’ paintings depicting still-life or the natural world. Matisse’s French Window at Collioure is technically ‘uninhabited’ but I think the central black area serves a similar function to Diebenkorn’s figures even though it bears no anthropomorphic imprint. The eye projects a particular distinction between the dark rectangle and the tinted uprights to right and left, and assigns the rectangle a psychological or, dare I say, ‘metaphysical’ value. In practical viewing this isn’t a particularly outlandish state of affairs. It just means that vision engages with the black shape as if it could be more important or significant than the other vertical elements. The eye lingers on the area, staring at it with slightly raised intensity, as though there was a reason to do so, and is incidentally rewarded when the darker bits of drawing begin to emerge from the gloom. Though the shapes are equal in ‘formal’ terms, the centre is given priority by virtue of its metaphysical ranking. This is of course partly an illusion, but in the case of simple paintings with relatively few components, all fully exposed, such a raised claim on the viewer’s attention made by an otherwise standard, geometric shape makes a crucial contribution the experience of the work. I’ve avoided giving a specific interpretation of the black shape in French Window at Collioure, though I doubt it was a prediction of the darkness ahead in the Great War. [iv] It might be plausibly thought of as an effect created by the palpable absence of a figure or landscape in a place where such imagery is usually found. However, because the Matisse is so radically simple and contains few iconographic clues, I want to argue that the ‘metaphysical’ status of the rectangle isn’t dependent on its location in a representational system. The effect can easily be transferred into examples of abstraction that follow a comparable economy. The problem many commentators seem to have with simple, flat paintings is that they are not complicated deep paintings. They belong to different categories. The pictorial economy of complicated deep paintings depends on producing a swarm of countless small elements, organised into bundles with relatively unstable contours. Passages that appear convex suggest volumes while passages that appear concave suggest space. In the context of a material language of paint and ‘paintedness’, both volume and space might be said to be metaphysical in terms of their visual operation. The ‘swarm’ pictorial economy, developed by Cézanne, who gave the Impressionist dab motility, has been enormously influential in abstraction, especially in the gestural branch of Abstract Expressionism whose lingering influence is legible in Diebenkorn’s Berkeley series. Its main characteristic, apart from motility, is contingency. When the possibilities of abstraction are being discussed the built-in unpredictability of the ‘swarm’ is regarded as an asset. The hope is, I guess, that some entirely new entity might emerge from mobile complexity, if it’s agitated long enough, and if it doesn’t there’s always that swirling pigment to enjoy and admire while we’re waiting. It is maybe harder to see something surprising coming from the interaction of a small number of relatively inactive planar areas that don’t dig into the picture space. Part of the difficulty is to pick out, from the examples of painting that adopt the simple economy, those manifesting the metaphysical distinction I have been outlining. This is a problematic experience, for both painter and viewer. The danger is that, in material terms, simple paintings can look like décor, which was how many regarded the large canvases produced at the end of the High Modernist period. That art has been so systematically disregarded that there’s bound to be a movement soon called the ‘Modernist Revival’ (maybe after the big Caro shows later this year). If anyone wants to prepare for that eventuality, and develop a sensibility that will help in fully appreciating the achievements of the original exponents, they have to start by believing that French Window at Collioure is a great painting, probably Matisse’s best work. Diebenkorn was right about that, but he didn’t follow it up and instead relied too much on reiterating the bottom two thirds of View of Notre Dame. One also has to accept, perhaps, that the only thing stopping simple painting from being décor is metaphysics. Newman, who plainly influenced Stella and Noland, was forever writing about the metaphysical and the sublime, using those terms without embarrassment. His titles like Onement, or Vir, Heroicus, Sublimus underline his interest in appropriating a certain kind of philosophical discourse in the promotion of abstraction. In this respect he is in good company with Kandinsky, Mondrian even Malevich, who also felt the need to speak in metaphysical language when explaining their work. But by 1966 the terminology no longer fitted the world-view of the younger generation of abstractionists. The ‘art of the real’, and ‘what you see is what you get’ were more typical expressions of the period sentiment, as painting did its best to defeat objecthood. However in the historical moment I’m trying to recover, in 1966, the new pictorial economy came to be recognised at a time when a metaphysical vocabulary no longer featured in critical dialogue. In the same period, art that consisted of simple means and few components was fairly common and, though it could be dismissed as purely retinal, decorative and lacking in content by some, others took it very seriously. Yet the only way an arrangement of flat shapes can be taken seriously is if the work appears to have a metaphysical dimension, like the dark rectangle in French Window or Newman’s fourteenth station. Additionally, I’d like to suggest that a serious view of a simple work is justified if it conveys the sense (or illusion) that things couldn’t be arranged any differently, that the process that brought it into being is governed by fate. Scattered in the sayings of artists are references to situations in which the practitioner had little choice but to accept how things turned out. Given the importance of creative freedom this may seem perverse or paradoxical attitude. Here a version of Kandinsky’s notion of ‘inner necessity’ is often echoed to describe moments in the working process where moves and decisions seemed to be determined by circumstances rather than freely willed by the practitioner[v]. If the constraints of subject matter or imagery are loosened, as they usually are in abstract painting and sculpture, doing what’s necessary, within the constraints of the medium, guides behaviour even more explicitly. It stops the process being wholly aestheticised or dominated by a concept of good design, or balance, which leads to work where safe taste triumphs. The power of the framing silhouette to determine depicted events is taken a step further in Noland and Stella. The elements within the painting echo variations in the canvas shape, ranging from notched rectangle to lozenge, diamond, or combination of different figures in the irregular polygons. Once the stretcher has been built, the pattern of the pictorial structure in fixed. Fried called the structural devices of Newman, Noland and Stella ‘deductive’ but is at pains to contrast the operation of the literal shape of the support with the existence of a pictorial field constituted by the depicted events. This field is enough to stop the painting coming over as an object. With the closing of the modernist narrative, and in an era of provisional painting, it may be no longer possible to cite historical necessity as a pertinent factor. On the other hand, if something simple but stunning turns up, commentators may rediscover art history as a source of significance and use it to explain the appeal of an innovative intervention. I think the illusion of a metaphysical dimension found in French Window may still be available to contemporary abstract artists, in a modified form, but the idea of overt metaphysical content, of the sort aspired to by Newman’s titles, may be hard to reconcile with current thinking. That leaves internal necessity or fate to be more fully accounted for, which won’t be easy. Very occasionally I buy a lottery ticket. I always ask for a lucky dip, the digits on my ticket being generated by some randomised programme. However, the number that is published after the draw takes place is not the result of a random process. The lottery machines physically move the numbered balls inside a transparent chamber. After a flurry of activity, one is selected and placed in a chute, then a second, then a third and so on. They do not come out in numerical order, so have to be re-arranged to fit the sequence on the tickets. The process involves material forces, of a standard Newtonian type, that are beyond human control and the result exists as an extension of these forces, not as the product of chance. [viii] The privileged metaphysical status of the published number shows through most clearly when nobody has a winning ticket. When somebody does win, with either a lucky dip or a row of integers based on birthdays or other personally significant numbers, that is just chance. The paradox is that the event at the heart of the lottery draw isn’t random. Life may be a lottery, but the lottery really isn’t. It’s governed by fate. The point of all that is this; the significance of the lottery number is not visible. It looks very like those millions that are entered in the draw every week. If we participate we are submitting to fate, to the Newtonian necessity that governs the movement of the spheres, and determines the result. But when the result is known we can tell the difference in experience between looking at the numbers we have on our ticket and the ‘winning’ row. We take the result seriously, our eye dwells on it because we feel that it is, or more likely, that it could have been, significant. Yet it also looks like just a row of numbers. I have tried to suggest how to deal with paintings with few components, those identifiable by their shared pictorial economy. It’s true that they can easily be dismissed because they look like things that are shallow or lightweight, but they should be taken seriously. If this attitude change could be reinforced by recovering the moment of 1966, when French Window at Collioure, The Stations of the Cross and Moultonboro III, were shown, it might be possible to reset the machinery of appreciation into a more nuanced mode. The bright glare of post modernism, like sodium lighting, has made some things invisible, but as it fades other strategies of vision could come back into play. One tuned to ‘metaphysical’ possibilities, yet committed to materiality, may prove productive, for both painters and viewers. [i] Henry Matisse, Retrospective, 1966. University of California, Art Institute of Chicago, Museum of Fine Arts, Boston. Clement Greenberg wrote ‘Matisse in 1966’ for the Boston Museum Bulletin relating to the exhibition. He mentions neither painting, but I don’t think he actually saw the show. [ii] Dunn International, Tate Gallery, London, Nov-Dec 1963 and 54-64 Paintings & Sculpture of a Decade, Tate Gallery, London, April-June 1964. [iii] Having seen his work in both London exhibitions I had a conversation about painting with Diebenkorn in November 1964. I was 19. [iv] This insight comes from Louis Aragon, many years later, who further thought the rectangle opened onto ‘events to come that will plunge the lives of unknown men and women into darkness, the black future, the inhabited silence of the future.’ From Hilary Spurling, Matisse the Master, 2005, p. 162. [v] For Kandinsky, inner (or internal) necessity seems to relate to obeying a psychological or expressionist imperative. I’m using the term more broadly to include other imperatives. [vi] Michael Fried, Three American Painters, (1964), in Michael Fried, Art and Objecthood: Essays and Reviews, (1998) p.233. [viii] The three Fates of Greek mythology have different functions. Clothos is the spinner, who spins the thread, Lachesis who measures each length, and Atropos, who is the cutter. All three are represented in the imagery of the lotto machine. This is an interesting read David, but you’ll have to forgive my ignorance. I’m having trouble coming to terms with your use of the words metaphysical/metaphysics in this text. Would you care to explain further the “metaphysical value” you ascribe to the black form in the center of “French Window at Collioure”? In what way does it address the nature of being, existence or first principles in a philosophical sense? Isn’t there a danger inherent to works of pictorial economy that, owing to their minimal formal parameters, they’re susceptible to a kind of “anything goes” interpretation? And are those interpretations embodied in the material form of the work, or do they exist solely in the mind of the viewer? Many thanks for your response. I’m aware of the origin of the term ‘metaphysics’ and its development in official philosophical discourse. I borrowed it and put it inside quotation marks but perhaps should have written it as ‘meta-physics’ to bring out the simple relationship between the prefix and what follows it, aligning it with terms like ‘meta-language’ or ‘meta-criticism’. In discussing (and in making) painting it’s often necessary to distinguish between the material, ‘physical’ means of the art form and other inclusive aspects such as ‘space’, which are part of the total experience of a given work. Pictorial ‘space’ seems ‘metaphysical’ because paintings are physically flat. In sculpture, space is physical not metaphysical. The dark rectangle in French Window does not address philosophical issues, so it’s not ‘big deal’ metaphysics. In material terms its made out of thicker paint, reversing the tactile polarity of the window and making the central ‘void’ tangible in contrast to the transparent supporting shapes to the right and left. It engages the eye in a specific way by creating an effect of significance, not necessarily significance. ‘Space’ also engages the eye, offering it sensations associated with depth perception, but not actual depth. For the viewer to engage with ‘space’ where there is none, or ‘significance’, they have to deal with something ‘meta’, that is something experienced ‘over and above’ or ‘along with’, a work’s materiality. This demands that the viewer participates in the work in a certain way, holding on to both its physical and meta-physical aspects. It’s possible to refuse to participate if the metaphysics are unconvincing. This is my problem with Rothko, and, incidentally, with Newman’s Stations of the Cross, but not his Vir Heroicus Sublimis. Or there may be an unsatisfactory relationship between limited material structures and the grandness of what we are asked to consider ‘along with’ the material. This is the problem of ‘over interpretation’ to which you refer. It’s also possible to reject the kind of pictorial economy I have described on the basis that it is somehow quantitively inadequate. It’s this rejection that the essay attempts to block. The meta-physics of ‘inner necessity’ or ‘fate’ offers a way of engaging with work of this kind. But participation is crucial to ‘get’ the point. Like the Lottery, you have to be in it to win it. I like the idea of interpretations that can “be embodied in the material form of the work”. And I’m very much into getting beyond the idea that interpretations can only be couched in a series of linguistic and contextual matrices that articulate themselves through hierarchies of knowledge. I also like the idea that interpretations can be articulated more clearly in the frisson between the public (shared and de-centered) and the private (singular) dialogues with the art works themselves. I say this after just seeing the Diebenkorn show again. I couldn’t stop thinking of Edward Hopper and that peculiar kind of anecdotal and misanthropic despair that lingers in his work. Funnily enough, this statement by Hopper from the 50s sounds a lot like the unhappiness registered by other commentators on AbCrit with the state of abstract art now. Sorry to keep quoting a ‘Realist’ but….. This sounds pretty much like Robin’s position. What interests me here is the notions of the “inner life” and the “private imaginative conception”. I wonder whether there are different ways to think about abstract art; or is there a kind of abstraction that wants to connect and share, to break away from the “private” world of the artist (and thus the forced voyeurism of the viewer) by using the visual realm in a different way. Are you saying David, that “economy” is a way of clearing a space for the viewer’s own projections and interpretations in the work? Or is this a ‘Utopian’ streak that has thoroughly run its course? It is interesting to hear some arguments for the reductive and ‘simple’ in abstraction’s DNA. Thank you David. I agree this is an interesting article, with a viewpoint very much at odds with my own. I’ll come back to that with a comment later, but I just wanted to pick up on what you say here, John. I think it’s dangerous to think we can easily separate the private from the public realm, because that can change so easily. The obvious example is Cezanne, who worked in an intensely private and isolated manner, but whose work 100 years later seems universal. A long-term view tends to nullify notions of contemporary relevance or “availability” of content. Who’s to say what will connect with future generations? I’m not saying they should in any way be separated, or are, or can be totally separate. I’m suggesting it’s the frisson, the tensions, the contradictions between the public and private that interests me. In what way is abstract art different to realist art in these respects? Are you suggesting that to be any good, you have to tuck yourself away in your mansion, on your hill squandering your inheritance?…Meanwhile the wage slaves depart to the cities in search of cheap thrills and art as novelty! Well, no actually, what I’m saying is work out and concentrate on what it is you are saying or want to say, rather than trying to second-guess “frissons” of interpretation now or in the future. Interpretation is for the Surrealists, not the realists, abstract or not. It’s no surprise that many of the perpetrators and apologists for simplistic abstract art, from Malevich onwards, resort to metaphysics and/or bonkers philosophy (and of course political interpretations – another favourite cop-out) for some kind of interest to the work, because it’s really boring unless you are conned into thinking that it is somehow more profound than its minimal content. Newman is a prime example of this unpleasant mixture of pretension and boring-ness, no matter his “net worth”; most of his American peers, like Rothko and Still, are not much better, once they settle upon their signature styles. Stella and some of his fellow minimalists, along with most of the post-painterly abstractionists, at least had the intelligence to disown the pompous embarrassments of such claims. Instead, they revelled in the boredom of “what you see” being no greater than “what you see”, even when there was very little to see. At least that seems to me more honest, and somewhere to start from; but I don’t see it as a great idea to get stuck with that, or suggest it is any kind of way to continue in the present. I would have thought the lesson to be learnt here is that the towering visual intelligence that was Matisse tried radical simplification once or twice and then left it alone. He, for the most part, delighted in the challenges of resolving complexities, rather than avoiding them. Although time passes fluidly as we make our work, our conscious awareness of this process is more staccato; perpetually taking in snapshots and making decisions. Thus we arrive at conclusions which embody the experiences of this journey, and if the journey is one of action, reaction and discovery we can generate a gravity which gives the final work its fullness as a work of art. If that journey is planned from the off or the friction of decision making minimised, these snapshots become increasingly superficial or ultimately irrelevant and gravity is lost. I think the reason why artists such as Matisse and Cézanne are so revered is because of the quality of snapshots they took on their respective journeys. At so many instances could so many things happen. You have to work really hard to get to the “hum” of art, or you can chose not to try, but you’ll end up with silence and will have to rely on providing the noise after the fact. A small bird continually eyes its territory, is ever watchful, twitchy and hyper-alert – electricity embodied….Life. Much of that makes sense Emyr. I continually come back to the apparent paradox that art is so important and yet generally not in the way it is talked about. This very difficulty opens up the world for all kinds of silly interpretations, etc. We enjoy living in the dark. This is not to say I have any profound answers. Could it be suggested that at particular points in history, ‘more’ might be achieved artistically by creating art that seems to be about ‘less’. This is not only just a set of logical and formally reductive art historical progressions into abstraction. It has a political and social dimension to it. In the case of Pollock or Newman- there seems to be some kind of intimation of a ‘Time Zero’ (especially mythologised where Newman is concerned)- a ‘clearing of the decks’ is attempted, as with Malevich before them. But while Malevich seemed obsessed by unrealisable futures, Newman was captivated by notions of an unreachable past (“The first man was an artist” etc; or look at Pollock’s assimilation of Navajo sand painting- a recognition and embracing of this visual art tradition rather than a cold colonial ransacking based on a distancing exoticist’s eye). Could Stella’s black paintings, from this perspective, be making a sly and critical nod both ways at once; both to Newman’s or Pollock’s attempts to reimagine the modern artist embracing non Western art as a new set of liberating influences; and also to Judd’s ideas about ridding his art of the European tradition and its relational forms of composition. But at the same time Stella is bringing into view a post war, post Holocaust and heavily ironised ‘present tense’- what Stella himself called a “Negative Pollockism”. (Think of the titles of some of these ‘black’ striped works, such as ‘The Marriage of Reason and Squalor’ (now a title for a film by The Chapman Bros- dedicated riders of Freud’s ‘death drive’), “Arbeit macht frei” or “Die Fahne hoch!”). In fact, by 1968 ( just two years after Mr Sweet’s all important 1966) Richter has repainted Stella’s black stripes as ghostly ‘Grey Streaks’. It is a painting of a photograph of a painting, replete with an uneasy critique of a new American art world dominance that is already starting to curl at the edges. America’s role as new leader of the ‘free world’ was hinged on an economy based in mass production, mass consumption (of images as well as objects), a huge alienated labour market and military expansionism called forth by Cold War paranoia. 1966 also saw both the Soviets and USA launching Luna modules that orbited the moon and the continued pathological one-upmanship of nuclear ‘testing’. In the meantime giant American B-52 bombers dropped thousands of tons of explosives on North Vietnam. Is it any surprise that one outpost of ‘advanced art’ of this period should wish to stand vehemently and/or impassively against this overwhelming deluge of mid-century crisis? It was a time saturated in images as never before. On the one hand images were beginning to get through of the absolute horror of the threat of mutually assured destruction and the real consequences of continued war against the ‘commies’; but on the other hand the same ever expanding mass media ceaselessly celebrated the banalities of life defined by alienated work and consumption. Is it any wonder that art of a certain kind should take a turn toward the ‘minimal’? We are well into a new era of image production and consumption. It’s an age of spectacular advances in digital media, surveillance, weaponry, image and data manipulation. Is it time once again to take refuge in the reductive languages of minimalism- that of grids, systems, repetition and geometry? It seems that way, if the renewed interest in this particular strand of abstraction is anything to go by. From ‘zombie formalism’ to ‘systems art’. From the rigorous ‘abstract’ languages of coding to the ‘spiritual’ retreats of concrete in the desert. Seems like we can’t get enough of it. If we see modern art as Meyer Schapiro did during the period in which Newman, Rothko and Pollock lay down the gauntlet to America’s cultural establishment and the international art world at large, then it becomes art that is “…. a social bond that furthers in aesthetic terms the process of human self-realization through the non-instrumental refinement of the senses, and through the critical engagement of the intellect…”  Implicit in this statement is the belief that we are all potentially active participants in the ever evolving definitions of art, not simply passive consumers of the next novelty turn or spectacle. The argument between visual ‘complexity’ and ‘economy’ from Schapiro’s perspective, becomes more of a dialogue to be shared and extended. When I look at minimalist art by Judd, LeWitt or Andre, I don’t just see attempted machined precision and highly reflective (if thumb print smeared) surfaces- all sealed off in perfect white cubes floating in the vacuum of reified hermeneutics or metaphysics. I see a set of visual dialogues with history, ready for continued and further debate. So I don’t think it is necessarily about “second guessing” the future because I see history as a socially negotiable and perpetually contested realm. Future art will always be born of the ferment of these ongoing dialogues.